A fantastic day was spent on Saturday 15th September at St Saviour’s Church, Branston. 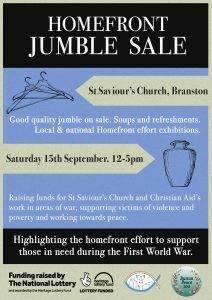 With a jumble sale full of good quality, delicious soup and cake- including a taste of a WW! Trench cake recipe. Many thanks to all how came along and supported this event, by providing or buying the jumble or refreshments. We also had on display several exhibitions commemorating the WW1 Homefront effort, particularly that of Lily Thomas, known in Burton for having set up one of the very first shops that collected essential items of clothing for those in need, especially for the soldiers. There are hopes to have another pop up jumble sale in one of the local community centres as there is still a good quantity of donations, so watch this space! Part of Burton Peace 100.